Thank goodness for my covered front porch patio! Rain, rain, rain lately! Yes, this area is covered and protected from most rain and sun. I have two adirondack chairs here with a vintage Red Wing crock that has been repurposed as a table with a wooden homemade cover. 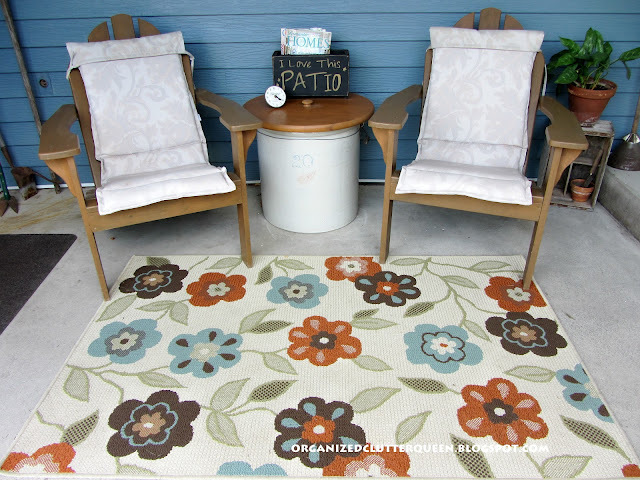 The indoor/outdoor rug is from Sphinx/Oriental Weavers, purchased last year. 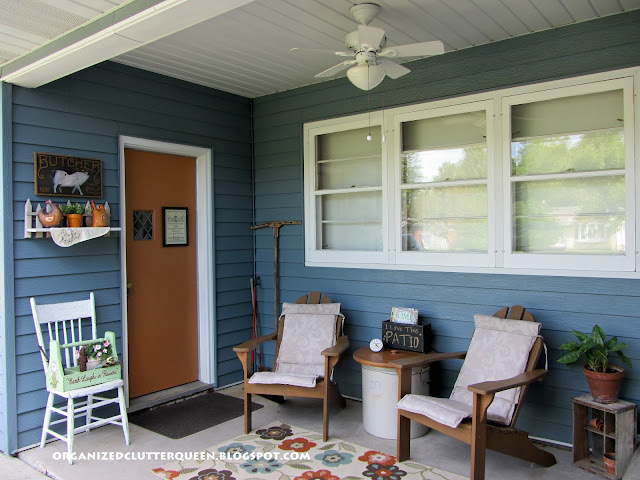 The left side of the patio has a side door to our garage with an outdoor vignette that I featured in a previous post. 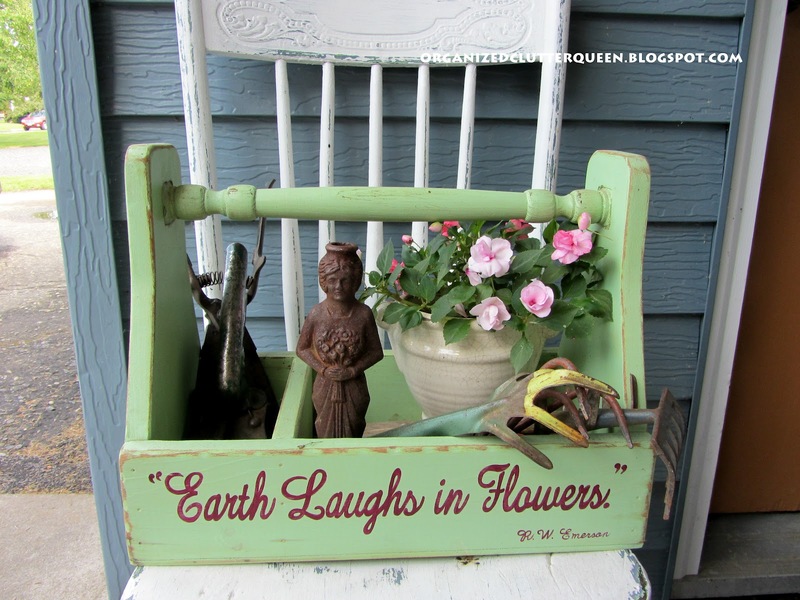 The impatiens have grown since the original toolbox post. 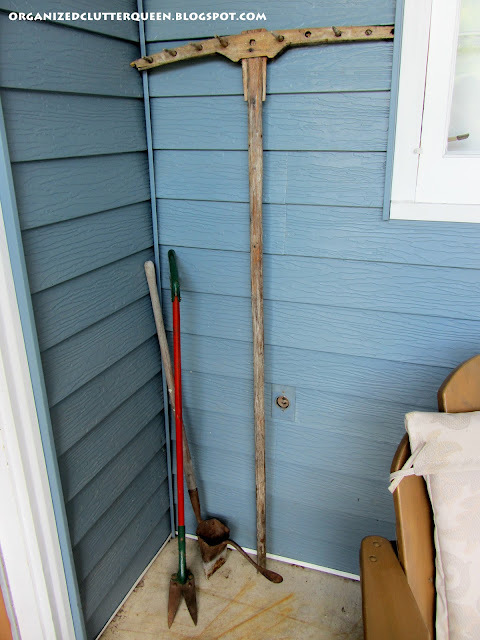 This corner has my vintage wood rake, seeder and a newly acquired grass clipper with handle. 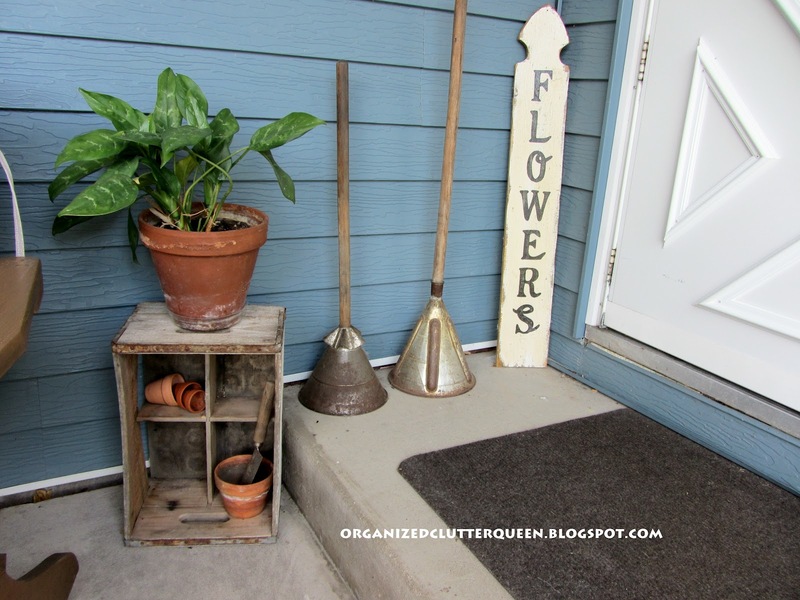 This is the step to the front door, with an old crate and a Peace Lily that winters indoors, two vintage laundry stompers and a "flowers" sign. The patio is cooled by a ceiling fan! If the deck is too hot or it's raining outside, this is the perfect place to sit! Great place to stay out of the sunshine...if we ever get any! Everything looks so beautifully maintained. Did you see the flood damage in Duluth?! And Grand Rapids, too. Our daughter worked until 3:00 this morning getting cleaning crews lined up for Target. Lots of damage and employee cars under water. We were lucky this time. Looks like sunshine for the rest of the week and I'm on vacation. Yeah!!! What a great space and such a pretty outdoor room. I love the rug paired with your adirondacks. This looks like the perfect place for morning coffee. What a fabulous covered patio. 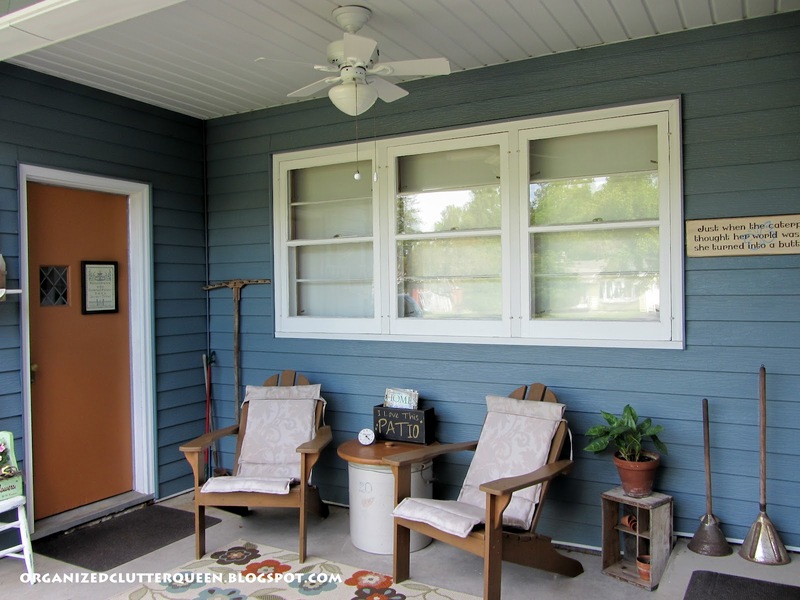 We have a screened porch I need to do over and make it special! I have a box like the green one and just might have to copy it. 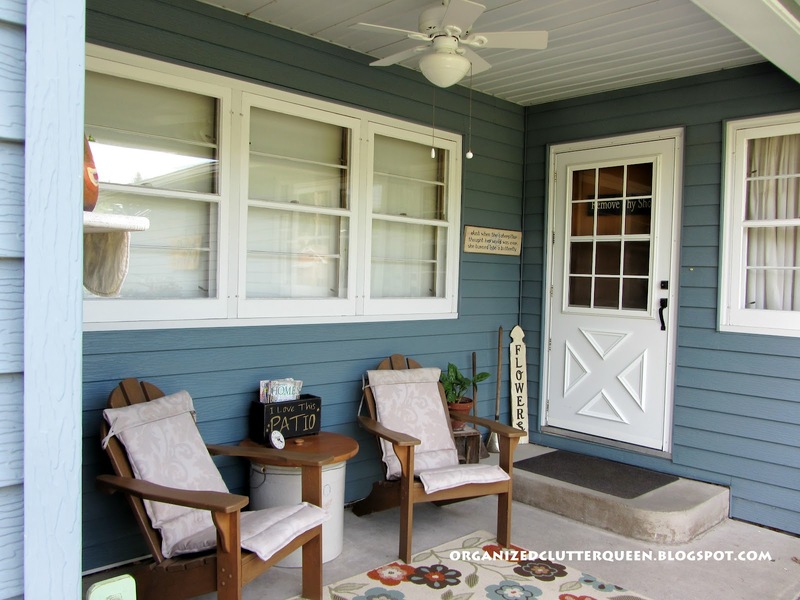 Lovely porch! I love that you put cushions on your chairs!!!! How comfy. I've never seen laundry stompers...those are great!!! Love your front porch patio! I enjoy seeing creative places like yours. 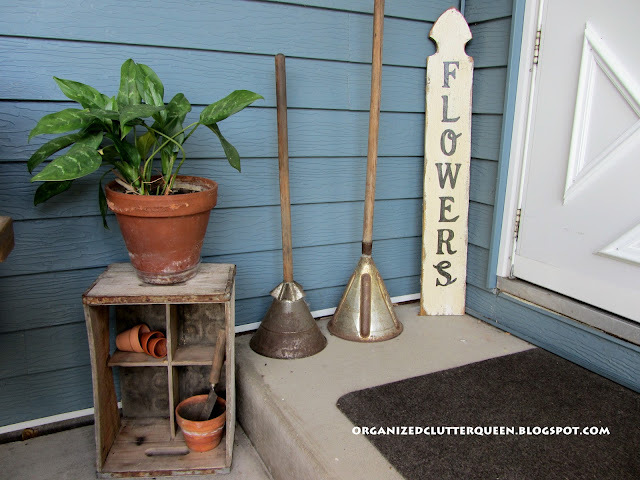 Your rug is so cheerful and the green toolbox is so cute! I used to have that quote on my blog! Those moths are a pain- we get Caterpillar Moths and some years they are everywhere. They ruin trees too. 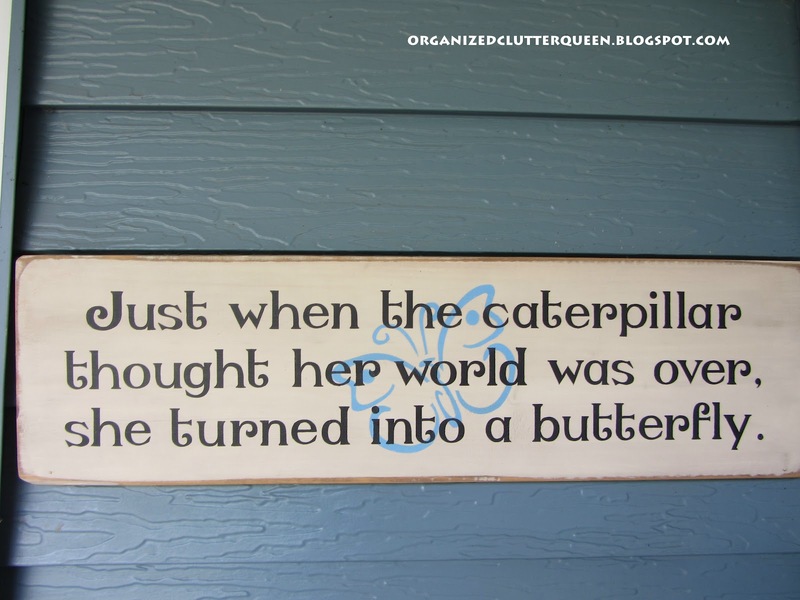 I love the quote about the caterpillar turning into the moth- so sweet! I'm going to have to keep my eyes open for vintage garden tools. I like that. 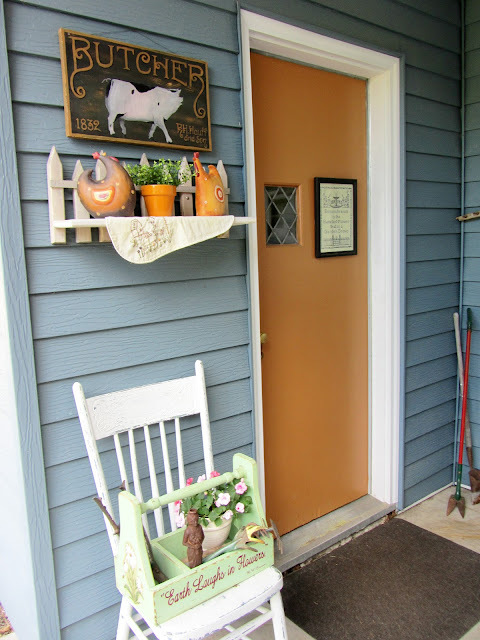 What a very charming and welcoming porch. I can see why you enjoy it so much. I love the caterpillar saying. what an absolutely fabulous space, i am having MAJOR front porch envy! Hi Carlene, Your porch looks like a wonderful place to relax outside. Love that it's covered and you have a ceiling fan! You've added nice personal touches to make it very inviting. Carlene, I love hou you used the crock as a table. It fits perfectly between the two chairs. What a fun place to relax and still enjoy nature. I am still loving the color of your door. Looks great with teh color of your home. Thanks for sharing with Share Your Cup. I love the crockpot with a lid between the two chairs. A perfect spot to set a cup of coffee. What a nice patio... looks like a nice place to sit and relax! Am I glad to find your website! What a great place! The only place I can sit is in my garage! LOL!